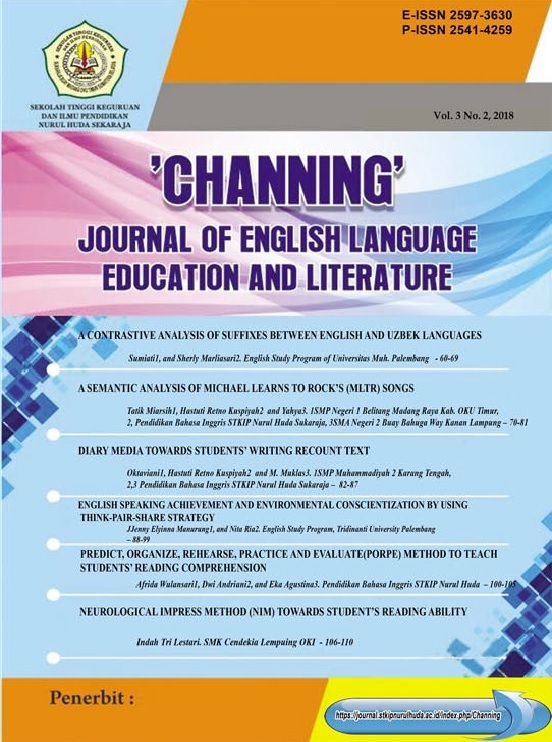 Channing: Journal of English Language Education and Literature is a peer-reviewed journal. It is published by English Education Program of STKIP Nurul Huda Sukaraja in both print and online version. It aims at reporting high-quality empirical and original research contributions for the benefit of teachers and researchers in the field of English language teaching. Especially for the teacher, they should be creative to find a suitable media, technique, strategy, and model in the teaching-learning process. The scope includes theory and practice in English language teaching and learning, language teachers’ training and education, teaching English as a second or foreign language. Channing: Journal of English Language Education and Literature P-1SSN 2541-4259 dan E-ISSN 2597-3630.